While everyone is buzzing about Meghan Markle’s choice of footwear for her latest appearance today with Prince Harry (she wore ultra-high stilettos to shoot some hoops at the Coach Core Awards held at England’s Loughborough University), there was something equally controversial that we want to point out. 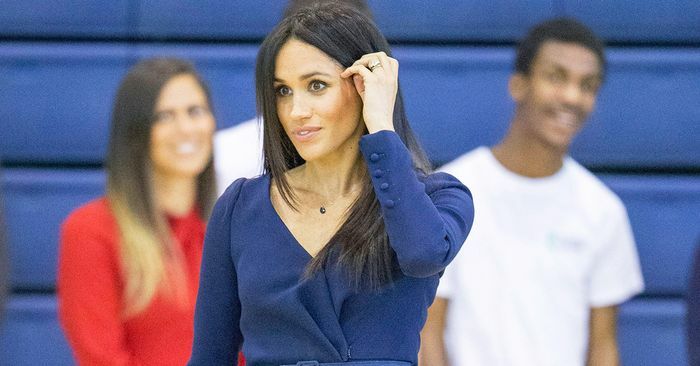 It’s not incredibly surprising to us that Markle wore heels to play sports, as it’s something Kate Middleton has also done in the past, and Markle spends a good 99% of her time in the public eye wearing heels. It was the arguably dated style “rule” that she broke in the process: wearing black and navy together. Sure, wearing two colors that are very similar to each other can be tricky, but we happen to agree with Markle that it’s perfectly acceptable to wear the hues together. In fact, we think it’s quite modern and sophisticated, just like Markle herself. Scroll on to see the flattering, chic way in which Markle pulled the controversial color combo off, and shop a few navy and black pieces for yourself.